Aidan presently operates three Auction Houses. All our auctions have viewing days. On such days the public are able to browse the saleroom and inspect the lots on offer. Use this opportunity to thoroughly examine those lots you are interested in. Aidan is always on hand to offer advice on lots of interest and will happily give an estimated sale price. All our Auctions are catalogued and we offer Online Internet Bidding at our Auction Rooms in Sixmilebridge and Galway. Unfortunately due to poor internet coverage in Doneraile we are unable to offer the facility at this venue. All our Catalogues are available to view online from this site. Each item for sale is photographed when possible. If attending an auction and intend on bidding you need to register. This involves completed a form giving your name and contact details. You will then be allocated a Bidder/Paddle Number. Should you be the highest bidder on a lot, showing the auctioneer your number will allow him to record you are the successful purchaser. Once finished bidding at the sale, simply return your bidding number to reception and they will calculate your bill. Paying for all your goods together at the end of the sale is often more convenient if you intend bidding on quite a few items. Bidding is as simple as waving your hand in the air (don't believe tales of people unwittingly bidding by scratching their nose or stretching!). Also don't be surprised if the auctioneer appears to be ignoring your bid, he will usually only take bids from two people alternately, moving onto a new bidder as one drops out. If you are unable to attend the auction but would still like to bid on an item, you can leave a Commission bid. This is an instruction for the auctioneer to bid on your behalf up to a limit set by you. To leave a commission bid simply ask for a bidding slip, fill in your details, the lot number of the items you wish to bid on and the limit up to which you would like to bid. What you pay at the end of the day is the hammer price plus the auction fees. Selling at auction as opposed to directly to the trade is likely to get you a better deal, it is in the dealers interest to give you as little as possible. It is the Auction Houses interest to get you as much as possible for your goods. At auction your goods will be exposed to a very wide audience of potential buyers particularly as our sales are very well advertised. We advertise in newspapers, we have an everychanging database listing and our catalogues are listed on the Easy Live Auction Website. Easy Live Auctions operate a Live auction Internet bidding service. Our investment in exploiting the international market of the internet has rewarded us to the extent that we have shipped goods all over the world. Aidan will happily advise and give you an appraisal of items being considered for auction. Collection can be arranged by the Auction house though there will be a charge by the removal company. Finally, once your goods are sold you will receive a cheque for the sale proceeds less the vendors commission, this is a percentage of the hammer price. 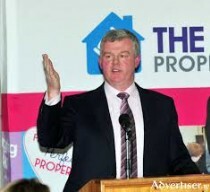 Don't hesitate to contact Aidan on 086 8260680 for advice on buying or selling at auction.